Disney Interactive and Lucasfilm have today announced the launch of Star Wars: Commander on iOS devices. The base-building combat game sees players traveling to Tatooine, where they’ll create a base and join either the Rebel Alliance or the Galactic Empire. The choice impacts the characters and military units players will have access to, as well as the game’s storyline and overall goal. The game makes the choice easy for players, as they are allowed to experience a single battle supporting both sides, and get a feel for the available units therein. To be specific, this sees users completing a single mission for Darth Vader, as well as one for Princess Leia, before making a decision. If players choose to back the Rebel Alliance, they’ll have access to iconic film heroes including Han Solo and Chewbacca, while backing the Galactic Empire introduces users to AT-ATs, TIE fighters and Stormtroopers, among others. Regardless of their choice, the general flow of gameplay is the same, and sees users building and defending a base from enemy forces. Users collect two main resources, credits and alloy, which can be spent on buildings, training units, upgrades to many buildings, defensive structures (turrets, walls, etc.) and more. A player’s alliance choice impacts the storyline, which is set within the Galactic Civil War of Episodes IV – VI, and plays out through level-based missions. Some missions can be completed at the home base (like those asking users to construct or upgrade a specific item, as examples) or through combat. During battle, players tap on the ground to send their trained forces into the fight, where they’ll automatically attack nearby enemies. These units are exhausted during combat, so players will need to train replacement units back at their base. Certain upgrades to structures can increase the types of available units, giving players a noticeable strength increase over time. Each battle is timed, and will end when time runs out, or when either side is completely victorious. Gamers pillage credits and alloy while destroying enemy bases, and this is successfully collected even if all of the player’s army falls in battle. Gamers earn up to three stars for each mission, depending on their success, and will receive free premium currency when they complete chunks, or chapters, of missions. Battles can be replayed to earn missed stars. Outside of single-player gameplay, users can spend their credits on multiplayer battles. Gamers can also join squads with their fellow users, and send troops to one another for extra help during battle. Users can track the strength of squads on in-game leaderboards. By inviting their Facebook friends to play, users can also track their progress against their friends over time. 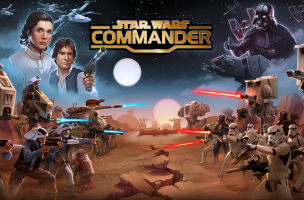 Star Wars: Commander is available to download for free on iOS. The game will be released on other platforms in the future.